Fiat was one of Italy's automotive pioneers and has been involved in international motorsport from the dawn of motoring. In those early days the Turin based company manufactured all-out racers in contention for the overall victory like the legendary 22-litre Mefistofele. From the 1930s the focus shifted to class victories with racing cars derived from the manufacturer's road cars like the much more modest 508 Balilla. 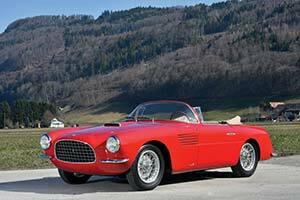 At the 1952 Geneva Motorshow, Fiat stunned the gathered crowd with an all new car, developed especially for racing. Powered by a 2 litre V8 engine, the car was simply known as '8V' or 'Otto Vu' in Italian. This to prevent problems with Ford, who, Fiat believed at the time, had claimed the V8 type-name. It was designed specifically to take on the two litre class, which was a highly contested class of the Italian championship. Fiat faced competition from Maserati, Ferrari and Lancia, who all had a two litre racer. Fiat's V8 was derived from two four cylinder blocks mounted on a common crankcase. To keep the engine compact, the angle between the cylinder banks was just 70 degrees. A centrally mounted camshaft operated the valves by pushrods. Breathing through two Weber Carburetors, the engine was good for 105 bhp and with an extra Weber 115 bhp and eventually 127 bhp could be achieved. Fiat's potent V8 proved to be a good match for Maserati's straight six, Ferrari's V12 and Lancia's V6. A traditional steel tubular frame was used and the car was independently suspended all-round. Fiat's chief designer Fabio Luigi Rapi was responsible for the factory body, which featured two large headlights in the grill and two smaller lights in the fenders. The second series body featured four headlights in the fender to comply with the GT regulations. Milanese coachbuilder Zagato first modified five of the factory bodied cars before producing a run of around 25 custom bodied 8Vs. Especially the Zagato 8Vs, which benefited from additional engine tuning and feather light bodies were highly successful in the Italian Championship. Highlights of the fine handling car's lengthy career included clinching the 1954 Championship and winning its class in the 1957 and final Mille Miglia. With only 114 examples built in total and a relatively brief racing career, the 8V is a little known Italian masterpiece. It remains as the only Fiat ever to be powered by a V8 engine and embodies Fiat's brief spell of racing success.